Whew....I'm glad it's Monday, I didn't have time to create much over the weekend, we celebrated my son's graduation. Boy those kids can eat! 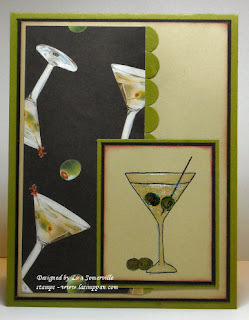 The sketch that MJ created today is one that can be used for many images - my Martini image is from Lasting Impressions with Panache. I added stickles to the Martini glass to give it some shine. The scrap paper is from Mitchael's. Here's MJ's original sketch...if you'd like to play along you can leave a link to your card on this post, or if you upload to SCS, use keyword TSSC23. This is great Lisa. That paper is too cool. I love how the glass looks with the shine. Thanks for playing. What a neat card lisa, I love that paper!! Yahoo, love your card. It reminds me of the song "It's 5:00 somewhere". Love your cocktail glass. what?! no technique?? The world has gone MAD! MAD I'LL TELL YA! Cheers to you, Lisa! Love the card!! Hey, I KNOW you were thinking of me when you made this card! Remember Memphis GF!